This article is focused upon the monumental event recorded in Acts 2 when, on the Jewish holiday of Pentecost, the Christian Church, the Body of Christ on earth, was born. None of the “about 120” who first received the gift of holy spirit that morning, or the “about 3000” who believed Peter’s subsequent message and were born again shortly thereafter, understood the earth-shaking significance of that day. None realized that they were the first members of a theretofore undreamed of group of people unlike any who had ever lived. Wherever Jesus went, he exercised the power of God to prevail over Satan and destroy his works, but he could directly do nothing about what was going on anywhere else. The Sacred Secret that was hidden in God, which, had Satan known, he would not have crucified Jesus, was that Jesus would diversify himself into worldwide body of people. Each would be anointed and equipped with holy spirit, as he was, and could therefore do the works he did. Satan would much rather be facing one Jesus than millions of Christians capable of being like him and doing what he did. The Day of Pentecost ushered in sweeping changes as to how God related to His people, and one of the biggest changes was in regard to the gift of holy spirit. Before Pentecost, God chose who would receive it, gave it conditionally and temporarily, and to only a few believers. As of Pentecost, everyone who chooses to confess Jesus as Lord and believe that God raised him from the dead (Rom. 10:9) receives the gift of holy spirit, the absolute guarantee of salvation. Each is thus equipped to “re-present” the Lord Jesus, the Head of the Body of which each of us is a vital part. As such, every Christian is a full time minister of the Good News of Jesus Christ. (7) But to each one of us grace has been given as Christ apportioned it. (12) to prepare God’s people for works of service, so that the body of Christ may be built up. Yes, there are what we might call “leadership ministries”—apostles, prophets, evangelists, pastors, and teachers, but they are not to be the only ones doing the work of the ministry (serving). Each member of the Body is to do his part, and each one can because, via the gift of holy spirit, each is directly connected to the Head. As per the following verse, you can utilize all nine manifestations (abilities) of that gift to walk in this dark world and be a shining light for the Lord. In the Old Testament, God instituted a priestly hierarchy among His people, Israel, and the leaders were easily recognizable by their special clothing and their titles. In the Body of Christ, however, there is no such “pecking order.” Each Christian has direct access to the throne of grace, as well as the right (and responsibility) to speak the Word to any other member of the Body. There is authority in the Church, but it is earned by loving service, is voluntarily acknowledged, and is always relative to the overall authority and lordship of Jesus Christ. (8) If it is encouraging, let him encourage; if it is contribution to the needs of others, let him give generously; if it is leadership, let him govern diligently; if it is showing mercy, let him do it cheerfully. So what is your gift, your longsuit, you part? If you are not sure, the way to find out is to press into your personal relationship with the Lord Jesus, get involved in a part of his Body (a group of Christians) and take advantage of every opportunity to pray, teach, sing, write, give, cook, counsel, share your heart, or help someone in any godly way. See what comes naturally to you, what you like to do, what you are good at. Know that your Father and your Lord value you and have a personal curriculum of learning and growth for you. They are eager to energize you and help you present their heart to the world. (10) Each one should use whatever gift he has received to serve others, faithfully administering God’s grace in its various forms. (11) If anyone speaks, he should do it as one speaking the very words of God. If anyone serves, he should do it with the strength God provides, so that in all things God may be praised through Jesus Christ. To him be the glory and the power forever and ever. Amen. Romans 16 is a unique chapter in the Church Epistles, and if you’ve not read it lately, take a look at it and consider the fact that 35 of your fellow Christians are mentioned by name, along with quite a few others less specifically. Take time to think about what is said about various ones, for no doubt some of those descriptions could be said about you. Ponder the fact that each one of them was unique, like you, a man or woman plagued by a sin nature yet filled with the divine nature of Christ. They made choices to do what they could for the Lord. So can you. 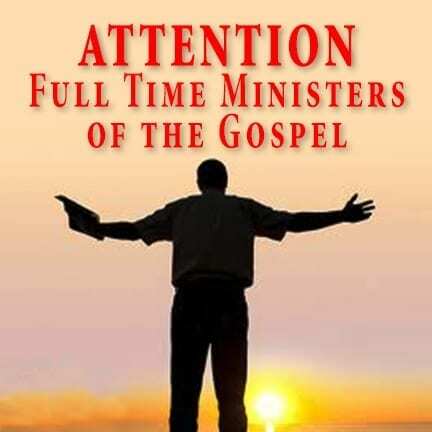 Whether or not you are ever paid as an employee of a ministry, you are a full time minister of the Good News of your Lord Jesus Christ, so go forth each day and serve the Bread of Life to those in your world.